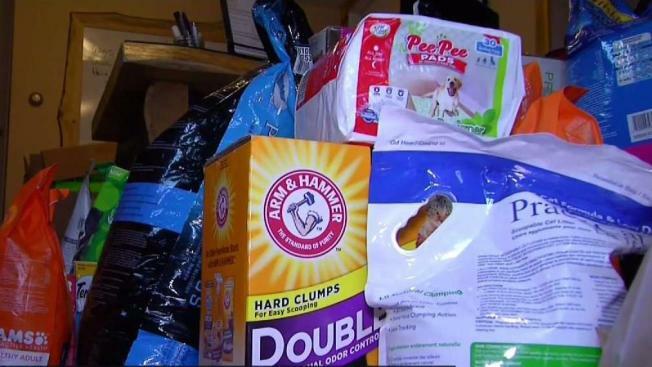 People in New England are donating pet supplies to a local rescue group, which will bring them to Texas to help dogs impacted by Hurricane Harvey. For the past two days, people from throughout the Boston area have been dropping off pet supplies for furry victims of Hurricane Harvey. PAWS New England in Ashland, Massachusetts, is taking donated items down to Texas. "The big rescues and shelters will be taken care of, they'll get donations. These are for smaller rescues and for our foster dogs in these homes that have been flooded; those people lost everything," said Jo-Anne Hutchinson, the co-founder of the local rescue group. On the return trip, PAWS New England will bring back nearly 30 foster dogs, some of whom were with families whose homes have been flooded. "If we move 20, 25, 30 dogs, then they can take in 25 or 30 dogs who might be on street," said Hutchinson. Volunteers, neighbors and animal lovers all stopped by with bags of dog food, bins of flea and tick medication and dozens of crates. "It's heart-wrenching to see animals and people and children displaced," said Cheryl Rose, who fosters dogs in Norton. "Hopefully, we can give them something." And it seems the only thing greater than the need is the generosity of the community. "I wish I had a bigger vehicle, I would have brought more," said Rose. The dogs headed up to New England will continue to be fostered by local families then will be available for adoption soon.